Oracle's second-quarter revenue rose 2 percent to US$9.3 billion while net income dropped 1 percent to $2.6 billion, with new software license and cloud subscription revenue flat and hardware product revenue continuing a long slide. Since getting into the hardware business with the purchase of Sun Microsystems, Oracle has maintained it has no interest in selling commodity servers against the likes of Dell and Hewlett-Packard. Instead, it is focused on selling specialized "engineered systems" such as Exadata, which also hold plenty of lucrative software licenses. 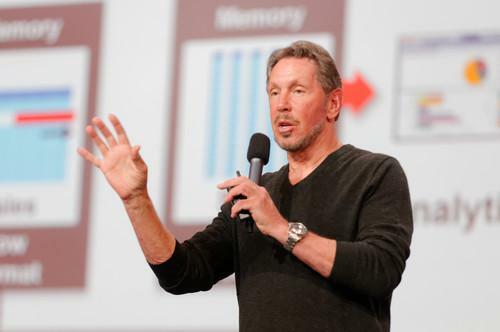 That said, earlier this year CEO Larry Ellison said Oracle expected its hardware business to start growing this fiscal year. In fact, hardware growth will occur in the next quarter, Oracle co-president Mark Hurd said in a statement. Oracle's Exadata, Exalogic and Exalytics systems experienced "double-digit" revenue growth, while the SPARC SuperCluster and Big Data Appliance product saw revenue grow a triple-digit rate, Hurd said. Oracle's "billion dollar" SaaS (software as a service) business saw bookings grow 35 percent in the quarter, with the strongest sellers being Fusion HCM (human capital management) and Fusion Salesforce Automation, Ellison said in a statement. Ellison and other executives are expected to discuss Oracle's results further during a conference call Wednesday. Some 38 percent of Oracle customers use Salesforce.com, up 30 percent from a year ago, and another 15 percent of Oracle's installed base is either planning to migrate or evaluate Salesforce.com, according to a new report from Morgan Stanley, which recently downgraded Oracle's stock. be unable to stem the tide of continued migrations to Salesforce.com and potentially Workday offerings." Oracle will likely have a healthy on-premises software business "forever," said analyst Ray Wang of Constellation Research. Still, like every on-premises software vendor Oracle faces a challenge keeping investors happy, as some of its revenue shifts away from perpetual licenses and their attendant large, up-front payments to cloud subscription fees, which are recognized differently on balance sheets, he said. Observers will be looking to see how quickly customers upgrade to Oracle's new 12c database. The Oracle database's broad presence in enterprise IT environments not only generates ample revenue but also keeps customers wedded to Oracle in general, since many of them build custom applications with the software and unraveling the database layer is no small task. Most Oracle database customers wait until the second release of a major new edition, preferring to let early adopters deal with any lingering bugs. While the question remains of how many customers complete that upgrade or port their systems to rival databases, Oracle is hoping 12c's cloud-friendly features and an upcoming in-memory option will keep them in the fold. There's other work for Oracle to do as well, given the growth in technology spending at the departmental level, such as marketing and human resources, Wang said: "They need to shift from a product-centric, techy marketing message to talking about business outcomes."